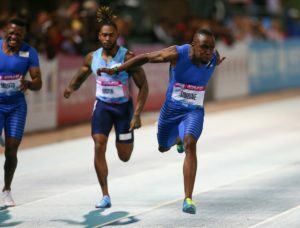 Akani Simbine and Henricho Bruintjies are undoubtedly one of the major drawcards in the men’s 100m at the 3rd and final Liquid Telecom Athletix Grand Prix Series Meeting at the Dal Josaphat Stadium, Paarl this coming Thursday, 22 March 2018. For Simbine, it’s a final test before departing to the Gold Coast, Australia for the Commonwealth Games, while for Bruintjies it is a home coming and an opportunity to race in front of his home crowd (Paarl) where he will gun for the scalp of his friend, Simbine. The much expected duel between the two did not materialise at the national championships, with Simbine withdrawing after the first round as a precaution. Simbine had complained of a tight hamstring and after consulting with his coach, withdrew from the race. Bruintjies went on to win the bronze medal. Now the two will go head-to-head at the final Grand Prix Meeting in Paarl. Bruintjies grew up in Paarl, so for him to be able to race in front of what is still his hometown, has special meaning. Bruintjies is the last man to beat Simbine on South African soil in the 100m after he edged the South African record holder at the 2016 ASA Senior Championships in Stellenbosch, a stone’s throw from where Bruintjies grew up. Included in the 100m field are: the national champion in the 100m, Simon Magakwe, the 200m SA champion, Luxolo Adams as well as Roscoe Engel who finished 4th at the national championships and Retshiditswe Mlenga, the 18-year-old World Youth Champion who finished 5th at the national championships in the 100m final. Tickets can also be purchased at the gate on event day.